Infantile fibrosarcoma (IF) is a rare malignant soft tissue tumour in infancy. It can be mistaken as a benign vascular tumour as both share similar clinical presentation and imaging features. We present a 4-month-old girl that initially presented with a small red spot lesion over the right wrist since two weeks of life which had progressively increased in size. The magnetic resonance imaging features were suggestive of a benign vascular tumour that was thought to be an infantile haemangioma. Child underwent total excision of the lesion. However, histopathological examination revealed an infantile fibrosarcoma. We discuss and highlight the radiological features of IF, which often overlaps with vascular benign tumour and also discuss some of the salient features to differentiate between these two diagnoses, as it will lead to different prognosis and management. We believed that in a large soft tissue lesion, whenever the size increases rapidly and disproportionate to the growth of the child, a malignant lesion needs to be excluded and IF should be in the differential diagnosis especially when there is additional presence of intratumoural bleed. Infantile fibrosarcoma (IF) is a rare malignant soft tissue tumour in the paediatric population which has been said to be a great mimicker of infantile haemangioma (IH) either clinically or radiologically.1,2 About one third of infantile fibrosarcoma present at birth and is often seen in the first 5 years of life.2 Herein, we present a case report that aims to discuss the clinical and radiological features of IF. We also highlight recent literatures which stress on some differentiating features between IF and IH that can aid in the management of soft tissue lesions in children. A 4-month-old baby girl, who was born at term, presented at two weeks of life with a small red spot over the right wrist, which has rapidly increased in size. On examination, there was a raised erythematous dry skin mass lesion measuring approximately 10 x 8 x 16 cm with minimal serous discharge and contact bleeding (Figure 1). There was no regional or distant lymphadenopathy palpable. Her haemoglobin (Hb) and platelet counts on admission was 10 g/dL and 393x106/L respectively. Her coagulation profile, i.e., PT/APTT levels, clotted, but there was no previously documented deranged coagulation profile. She was diagnosed with ulcerated infantile haemangioma in proliferative phase and was started on syrup propranolol with differential diagnosis of tufted haemangioma. There was an episode of active bleeding from the lesion. No information was described on the colour change in the case note. Compression was done and subsequently bleeding stopped. Another episode of bleeding had occurred, causing a drop in Hb level to 6.9 g/dL, requiring blood transfusion. Culture sampling from the lesion grew Staphylococcus aureus. She was treated with intravenous (IV) cefuroxime for a week. Magnetic resonance imaging (MRI) was performed three months after the initial presentation to further evaluate the lesion. At the time of imaging, the size was unchanged as compared to the size prior to propranolol therapy. MRI demonstrated a large superficial skin mass centred at the dorsal right wrist. The mass extended superiorly up to the distal third of the radius/ulna level and inferiorly to the proximal carpal bones level. It measured 5.8 cm in maximal dimensions. The mass was isointense compared with muscle on T1 weighted (T1) imaging and hyperintense on T2 weighted (T2) imaging with multiple flow voids within representing intratumoural vessels. On post-contrast, the mass showed homogenous enhancement with prominent vessel at the periphery of the mass, which represented a feeding artery. There was progressive enhancement of the mass on contrast-enhanced dynamic magnetic resonance angiography study, which demonstrated centripetal pattern of enhancement (Figure 2). The child underwent total excision of the mass lesion with pre-operative diagnosis of infantile haemangioma. The tissue specimen was reviewed by paediatric histopathologist which was reported to show presence of cellular spindle-shaped cells with tumour cells forming irregular fascicles and occasionally arranged in a herringbone pattern. The histopathological examination (HPE) was concluded as infantile fibrosarcoma (Figure 3). Immunohistochemical studies showed the tumour cells were positive to vimentin and negative to Smooth Muscle Actin, desmin, CD34 and S100. However, molecular tests for fusion genes were not performed. Unfortunately, there was no imaging study to exclude lymph node and distant metastases before the operation since the indication for operation was to stop the bleeding of a lesion that was thought to be benign. Computed tomography (CT) scan thorax was done post-operatively after the HPE came back as IF which showed no distant metastases. Post excision, the patient underwent chemotherapy for a total of 22 weeks (16 cycles IV vincristine and 8 cycles IV actinomycin). She had a repeated MRI of the right forearm and hand 4 months post excision (after 9 cycles of IV vincristine and 5 cycles of IV actinomycin) that favours small residual disease. Another MRI of the right forearm was performed 3 months later after completion of chemotherapy showed no evidence of residual tumour. Figure 1 Supination (a) and neutral (b) position of the right hand photos show huge mass at the lateral dorsal right wrist, which has red skin discoloration, central ulceration and prominent vessels at the periphery. T1 hypointense and T2 hyperintense mass signal (arrow) and homogenous enhancement post contrast (a-c). (d) The dynamic MRA image shows enhancing mass (star) with an early opacified prominent feeding artery at the periphery (white arrow) likely the ulnar artery and radial artery (white arrowhead), supplying the mass. 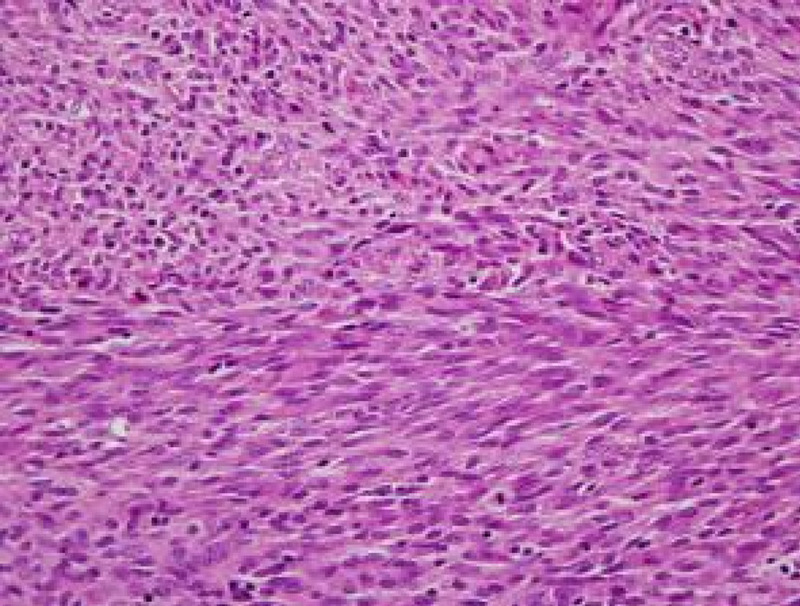 Figure 3 HPE show cellular spindle shaped cells with tumour cells forming irregular fascicles and occasionally arranged in a herringbone pattern consistent with infantile fibrosarcoma. IF usually presents with soft tissue mass on the extremity which accounts for 66% of cases followed by the trunk (25%).2 The tumour would commonly be large in size at the time of presentation, >5 cm and it shows rapid increase in size.2,3 The mass sometimes mimics the proliferative phase of haemangioma causing errors in initial clinical diagnosis.4 The skin changes which includes bluish or reddish discolouration is contributed by intratumoural haemorrhage and necrosis which are also common tumour behaviour that can also be applied to haemangioma.3,4 However, nothing was described regarding the colour change in the case notes for this patient. A large soft tissue mass in the extremities among infant population has no specific imaging features. Therefore, imaging would not be able to differentiate between a benign vascular mass lesion such as in infantile or congenital haemangioma, or intermediate/malignant mass lesion such as in infantile fibrosarcoma, tufted angioma or kaposiform haemangioendothelioma. Whenever the lesion is rapidly increasing in size and disproportionate to the growth of the child, a malignant lesion needs to be excluded and the risk is increased in the presence of intratumoural bleeding, and IF should be in the differential diagnosis. dermatologist, Dr Sabeera Begum KI and other dedicated radiologists, Dr Normawati Mat Said and Dr Zaleha Abdul Manaf for their professional input and comments on the manuscript who are also involved in the management of the patient. 1. Orbach D, Rey A, Oberlin O, et al. Soft tissue sarcoma or malignant mesenchymal tumors in the first year of life: experience of the International Society of Pediatric Oncology (SIOP) Malignant Mesenchymal Tumor Committee. J Clin Oncol 2005;23:4363-71. 2. Orbach D, Rey A, Cecchetto G, et al. Infantile fibrosarcoma: management based on the European experience. J Clin Oncol 2009; 28:318-23. 3. Laffan EE, Ngan BY, Navarro OM. Pediatric soft-tissue tumors and pseudotumors: MR imaging features with pathologic correlation: part 2. Tumors of fibroblastic/myofibroblastic, so-called fibrohistiocytic, muscular, lymphomatous, neurogenic, hair matrix, and uncertain origin. Radiographics 2009;29:e36. 4. Hu Z, Chou PM, Jennings LJ, Arva NC. Infantile fibrosarcoma-a clinical and histologic mimicker of vascular malformations: case report and review of the literature. Pediatr Dev Pathol 2013;16:357-63. 5. Bhat V, Salins PC, Bhat V. Imaging spectrum of hemangioma and vascular malformations of the head and neck in children and adolescents. J Clin Imaging Sci 2014;4:31. 6. Alymlahi E, Dafiri R. Congenital-infantile fibrosarcoma: imaging features and differential diagnoses. Eur J Radiol Extra 2004;51:37-42. 7. 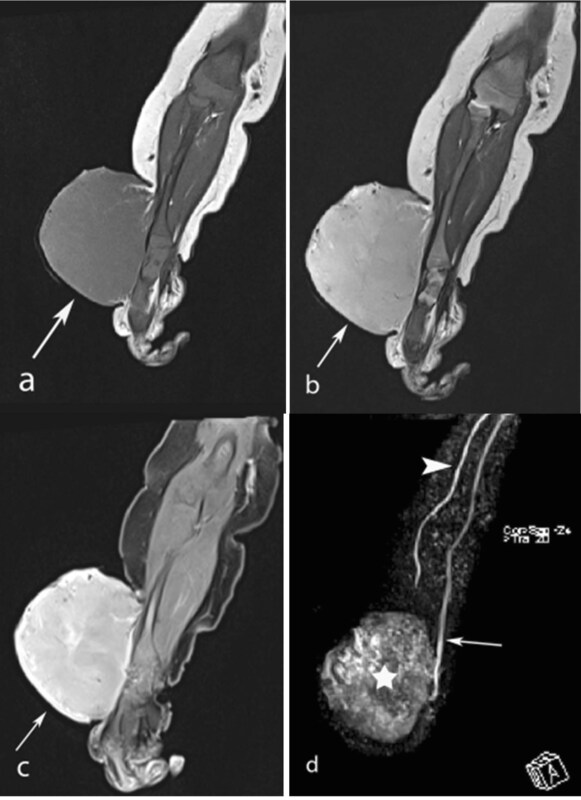 Canale S, Vanel D, Couanet D, Patte C, Caramella C, Dromain C. Infantile fibrosarcoma: Magnetic resonance imaging findings in six cases. Eur J Radiol 2009;72:30-7. 8. Ainsworth KE, Chavhan GB, Gupta AA, Hopyan S, Taylor G. Congenital infantile fibrosarcoma: review of imaging features. Pediatr Radiol 2014;44:1124-9. 9. Loh ML, Ahn, P, Perez-Atayde AR, Gebhardt MC, Shamberger RC, Grier HE. Treatment of infantile fibrosarcoma with chemotherapy and surgery: results from the Dana-Farber Cancer Institute and Children's Hospital, Boston. J Pediatr Hematol Oncol 2002;24:722-6.